Former worker James Ross has won £12,000 in compensation from the £1.8bn firm. 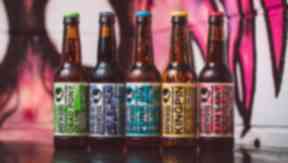 A former BrewDog employee who was sacked because he was going blind has won £12,000 in compensation. BrewDog suspended Ellon warehouse worker James Ross after he reported his eyesight was deteriorating. The 47-year-old was later dismissed, despite experts saying he could continue to work if adjustments were made to his job. An employment tribunal has now ruled that BrewDog unlawfully discriminated against Mr Ross and treated him unfavourably because of his blindness. The brewer, which was recently valued at £1.8bn, has been ordered to pay Mr Ross £12,052 in compensation. The employment tribunal said it would have ordered BrewDog staff to have undergone equality and diversity training. However, it said legislation introduced in 2015 prevented it from doing so. A BrewDog spokesman said: "We worked with James in order to find a suitable alternative role within the business where his safety would not be compromised, but James wanted to keep his packaging role. "We ended up in a position where we had to balance James' wishes with the best interests of the team around him, and while we regret that an agreement couldn't be reached, we have a moral responsibility to prioritise the safety of our team."